Loraine Brown has positively impacted countless lives with her bright personality and exuberant love for science during her 30 years as an instructor at Southern Illinois University Edwardsville’s Odyssey Science Camp. Brown retired from teaching at Whiteside Elementary in Belleville a handful of years ago. This year, she says it’s time to bid farewell to the camp in which she has happily invested her time and energy. For all 30 years, Brown has taught Odyssey 1 and 2, offering interactive instruction to children grades 2-4. Student after student can recall their camp days spent with Brown. “She was always happy and excited about the projects we were doing,” recalled 12-year-old Katharine Peterson. Brown has influenced entire families. Katie Robberson was once a camper in her class. Now, her son and daughter have enjoyed Brown as their camp instructor, too. “She likes to teach us,” added Emmie, Robberson’s 6-year-old daughter who started camp this year. Brown has also left an indelible mark on her fellow instructors. She is certain they will continue to help kids learn, grow and get excited about science. Brown will always remember that for 30 years the rockets she’s helped students create have successfully launched. Those whose lives she’s been a part of will always remember Brown’s boundless energy, kind demeanor, and passion for discovery and exploration. Brown was featured by the Belleville News-Democrat in an article posted Saturday, July 30. 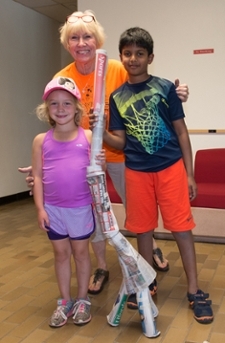 Photo: Loraine Brown poses with students Emmie Robberson (L) and Shreyas Medikonda (R) and the newspaper tower they built.